Mark Zuckerberg has always encouraged Facebook employees to think for themselves, but one issue is trying his patience. Some walls of Facebook’s offices are covered in whiteboards in chalkboards. Usually adorned with signs reading, “write something,” they’re covered in layers of messages, doodles and signatures from employees and visitors. “Crossing out something means silencing speech, or that one person’s speech is more important than another’s,” Zuckerberg admonished. A Facebook spokeswoman confirmed that the memo had been sent but would not tell CNNMoney if those responsible for the acts had been identified or disciplined. “There have been several recent instances of people crossing out ‘black lives matter’ and writing ‘all lives matter’ on the walls at MPK. 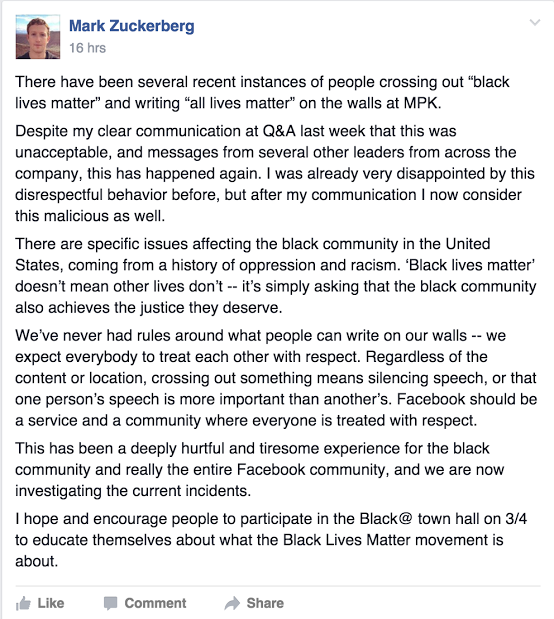 We’ve never had rules around what people can write on our walls — we expect everybody to treat each other with respect. Regardless of the content or location, crossing out something means silencing speech, or that one person’s speech is more important than another’s. Facebook should be a service and a community where everyone is treated with respect.